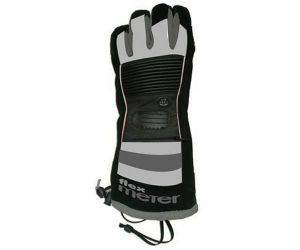 Snowboard gloves with protection of a Flexmeter wrist guard in which the risk of wrist injury drastically will reduce. These Snowboard gloves are lightweight, breathable and waterproof. Ventilation Air Flow System. This pair of snowboard glove is a very good purchase more quality for less price, unfortunately only available in size Large. Other sizes will not arrive anymore. See "Sizes" for your size. Make sure you order the correct size and measure your handcircumference, just hold your 4 fingers together and measure once around over the handbones. The thumb is not to be measured within. A double cheque and a determining factor for when your hand size falls on the borderline of f.e. 21 cm, than measure the length of your middle finger from the hand to the top of the middle finger. Mail the result of the measured hand size and in case mesaured lenght of middle finger or mention this onto the order placed. Outershell: 80% Nylon 15% Polyvinylchlorid 5% Trivinyl Palm: 50% Nylon 30% Polyester PU 8% Polyvinylchlorid 2% Trivinyl 10% Polyester Lining: 100% Polyester. Insert: Hydro-Tex Waterproof Breathable air density and glove liner. Handwash. Wash dark colors separately. No dryer drying.